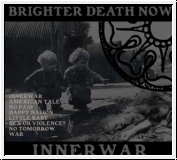 Innerwar has first been released in 1996 and still remains as one of the outstanding titles in the BDN catalogue - the title track "Innerwar" shows how far BDN is able to push the limits. There are none. The most disturbing, extreme and aggressive CD of BDN is now available to shock new generations of listeners or give old listeners the chance to refresh their mind about the disturbance BDN has created. All in new artwork - a must have! Spotvarnished-embossed digi-pack! Note:! The Artwork is not for people with limited brain capacity! Innerwar is an essential classic to all collections in the industrial, power electronic and noise scene.